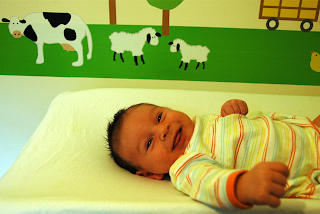 Place a bulletin board or sheet of cork on the wall near (but well out of reach) your baby's bed or change table. When objects and colors begin to fascinate your newborn, you can attach different objects and pictures to your Discovery Board for your baby to look at. Later, this can be a place to display your toddler's artwork. Watch out if you are using pins, though! I prefer to use a TAC-ON MAT or a fabric Memo Board. You can post up or rearrange your notices without using risky push pins or any other pin!